-How does the price of a new cellular phone compare to the price of a remanufactured phone? New cellular phones with a wholesale cost of $130 to $230 are generally given away free if the customers also signs a 1 or 2 year contract. In most areas if the customer purchases the phone without an annual service contract, the retail price of the phone is $250 to $300. A remanufactured phone priced at less than $100 is ideal for the 911 safety phone application. -Why is it possible to make free 911 calls with an unactivated cellular phone? This is all possible because of new FCC rules that mandate unactivated cellular phone owners without a monthly service contract, be able to make free 911 calls. The FCC also requires that pay phones make free 911 calls. For more detailed information read the following docket published on the FCC website. -Free 911 calling on a cellular phone seems too good to be true, aren't the cellular carriers concerned about this service requirement? They are concerned and effective December 1, 1997 all cellular carriers must honor the FCC ruling. Three of the top cellular carriers and wireless trade associations including the Cellular Telephone Industry Association CTIA have asked the FCC to reconsider it's 911 rules. The FCC rules mandate that even cellular phones without a service contract be allowed to make emergency calls. Edward Warner of Wireless Week gives an explanation of the wireless industries concerns with 911. "Studies regularly rate personal safety as a chief reason subscribers get cellular service and several of the carriers seeking reconsideration warned that the new rule would give those customers a free ride. PrimeCo Personal Communications noted that when the FCC imposed the obligation on commercial mobile radio services, it pointed to a long-standing requirement for free 911 calling from pay phones. However, pay phones are owned by local exchange carriers-which "are public utilities and carriers of last resort"-or by local exchange carriers competitors, PrimeCo noted. "There is no reasonable basis to expect 911 service from mobile telephones without subscribing" the company said." -Why is it possible to place calls on an unactivated phone? A cellular carrier cannot always identify where to bill the airtime for an activated or unactivated cellular phone. This generally happens when a cellular phone is roaming or in other words, placing calls outside the customers home market area. If the cellular carrier cannot identify the phone and where to bill the airtime, then manual roaming is offered. Manual roaming options to the caller are, charge the call to a credit card, charge the call to the callers home phone or call collect. Roaming Obligations. On August 15, 1996, the FCC issued a Second Report and Order and Third Notice of Proposed Rulemaking in CC Docket No. 94-54 concerning the obligations of a commercial mobile radio service (CMRS) provider to make roaming available to other providers of CMRS services. The FCC concluded that "cellular, broadband PCS and covered SMR licensees are required to provide manual roaming to any subscriber of any of these (CMRS) services who is using a handset that is technically capable of accessing the licensee's system." Manual roaming typically involves a situation where the subscriber provides the carrier (with whom the subscriber has no pre-existing contractual relationship) a credit card number or other means of payment. The FCC also raised questions as to whether it should require CMRS providers to enter into agreements with other CMRS providers to facilitate the provision of automatic roaming (which would not require the individual subscriber to present a credit card to the carrier with whom it does not have a pre-existing contractual relationship). The following complete document is provided from the FCC website. -What does one actually do with the phone to place a credit card call? How does one reach the cellular carrier who will consider you a roamer? To place a call, select the number on the phone and press the send button. A recording or live operator will assist with the charge or collect call in most areas. You will be asked for a credit card or collect call option. The customer is charged $1.20 to $1.80 per minute for credit card calls in most areas. -Can I "call in" to the emergency phones? Our emergency 911 cellular phones are not activated with a cellular phone service provider and cannot receive in coming calls. -Is the battery already inside the phone? Yes but it needs to be charged by plugging it into your car lighter or travel charger for a least 5 hour for the first charging. The phones are shipped with new batteries that are not fully charged. -Will the battery ever need to be replaced? Not for some time, it should last for years since you will not be charging and discharging in this application. -When the phone cord is plugged into the lighter a red light comes on. Is this just indicating that the connection is "live" and that it is ready to charge? -Can the Motorola DPC 650 phone only be used while plugged into the cigarette lighter? No, the phone can also get power by the battery and used without being plugged into the cigarette lighter for power. -If it has been charged, can we use it anywhere? If it is charged you use it anywhere there is cellular service. If there is no cellular service the NoSvc light will come one indicating there is no cellular service providers towers in that area and the phone will not make a call. If the Roam light is on the phone will make a call. -When we plug the phone into the cigarette lighter to build up the battery, should the power be turned off or on? The following is the best way to charge the phone so you know everything is working OK. Unplug the phone from the charger adapter, turn the phone off, plug the charger cord into the lighter for power and then plug the power cord into the phone. The phone display should light up indicating that is being powered and charged by the charger cord not the battery. -How long does it take to build up the battery? The first time the new battery is charged it might take 5 to 8 hours after that in less than 2 hours the battery will be fully charged. -The info sent along with the phone mentions that we should make a 911 call to check it out ..... do we just tell the person answering that we are testing a new phone??? That is correct and then wait for there response so you know your phones microphone is working. Thank them and press END to end the call, they will appreciate the short call since they are busy yet want to make sure you know how to use the phone in case of a real emergency. -What kind of battery does the Motorola DPC 650 use? Our AA Communications Emergency Cellular Phones use a New standard Motorola type 6 volt Nickel Cadmium rechargeable Battery. -Is this battery easy to find? You can purchase these at any Radio Shack or any store that sells cellular phones. These Motorola 550 phones are very popular and therefore stores stock these batteries. -Does it hold a charge for a reasonable length of time? If the phone is not used they will hold a charge for over a month. You can check the battery charge level by turning the phone on and pressing the FCN key then the 4 key then the display will show the battery strength. The battery needs to be recharged when 2 bars or less are showing. -Radio Shack sells the batteries for less than $20 we make them available to our customers for less than $6.95 plus $9.95 shipping and handling. AA Communications purchases older model Motorola cellular phones from cellular carriers and companies who also distribute cellular phones. Our technicians clean, refurbish, test and reprogram the phones. The phones are reprogrammed without a system ID and without a phone number which allows the cellular carriers to recognized the phone as a phone not under a service contract and allow it to legally make a cellular 911 call, collect calls and credit card calls. We elected to only use specific models of the highly reliable Motorola cellular phones. Due to the reliability and durability of the Motorola phone, the use of new batteries and other new accessory parts in the phone kits, we are able to offer a 24 month unconditional warranty. -How soon do you ship the phone after the order is placed? We ship all orders in less than a week after we get the order. We ship the phones by US Priority Mail which takes 2 to 3 days. Most orders should be received 7 to 10 days after the order is placed on our web site. Many times someone waits to order the phone just before a trip or a vacation and they cannot wait 10 days. If they send us an e-mail or call we will try to work the order to get it to them in time. Most of our business is from referrals therefore customer satisfaction is very high on our priorities. The vinyl Travel Pack is water resistant and has a canvas lining. It is large enough to fit the Motorola portable phone and coil cord charger as well as other items yet small enough to fit in any glove box. It has a zipper opening. The following is a picture of the Travel Pack. -What is the cellular coverage for the emergency 911 cellular phone? -Do you have an optional car adapter or know where one can be purchased? Yes, we offer a car adapter. 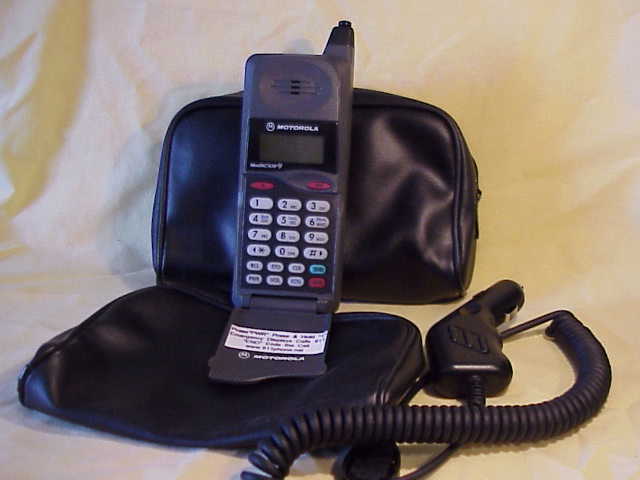 The Motorola phone (Ultra classic) is a popular phone and an optional car adapter can be purchased at most stores that carry cellular accessories. -I understand that with your phone, I'll be able to make calls with a credit card for a cost of approximately $1.50/minute. Will I be able to receive calls? You will not be able to receive calls because your phone is not registered with a cellular carrier. -If I have long distance charges, is that in addition to the $1.50/min (approx.) charge? -Do prepaid phone cards work with this phone? It depends on what type of prepaid phone card is used but most of the prepaid cards do not work. This is due to the fact that you have to place a call first to special 1-800 number. A phone card is generally billed to your home phone which does work. -If I have the AA Communications cellular phone in the car, will I be able to just get your service on an as need basis or do I have to sign up to use the phone on as need basis? It is not AA Communication's service, most cellular carriers provide this manual roaming service that does not require you to sign up for anything. The cellular phone can be activated for full service with a cellular carrier if you elect to use the phone on a more frequent basis. -Is it possible to use your unactivated phone in one's local area? You can use it your local cellular area or out of your local area, it is always recognized as a roaming cellular phone. -Will it be recognized as a "roamer"? Yes, in most areas, it is the cellular carriers option to recognize this phone. There are 2 carriers in each market and if one carrier "A" does not offer manual roaming the other carrier "B" has the option to allow manual roaming. 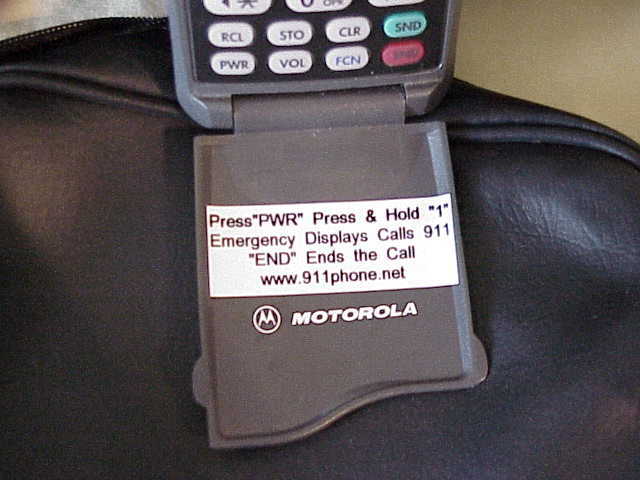 The phone is programmed to check both the B side and A side carrier when placing a call. -Does the local phone number need to be dialed in any special way to do this? If it is a local call the area code is not needed. -Is it possible to dial other free calls (like *HP here in NC for the highway patrol) or only 911? From our experience most free calls such as *HP and 911 are possible to complete with our phone in most areas. -What is the background on AA Communications? Creative Innovations started direct marketing communications products in 1987. AA Communications is a Creative Innovations company that distributes low cost refurbished cellular phones directly to consumers. Creative Innovations determined that there was a market interest to non cellular phone users when they were made aware of the product features without a monthly fee. AA Communications research determined that the internet was the most economical way to inform customers and market this affordable product. -Now to the larger question, why AA Communications? -There may be other companies that can help you find an emergency cellular phone. But only AA Communications has the people, knowledge and reputation to stand behind a 2 year warranty on the emergency cellular phone. AA Communications is the most experienced and trusted supplier of emergency 911 cellular phones on the Internet. If you have a question you can send us an E-mail, we will promptly respond. If you prefer to relay your question by phone please don't hesitate to call us toll free (1-866-987-3911) and leave a message. Telephone inquiries might be returned in the evening so please leave a number where we can reach you after 6:00 PM.